Not bad! But there were some rough edges we wanted to address. The header was full of technical information that wasn’t always what you wanted to see first. The screenshots needed polishing. And that toolbar on the bottom used a nonstandard UI convention. That fixed that problem, but it made the app display on top a bit disjointed, and exacerbated the problem with having the app metadata on top. And having the app name and icon only in the toolbar made it easy to mistake the caption for the name! Whaddaya think? I’ll tell you what I think: it’s fantastic, and you guys are going to really love this app view. 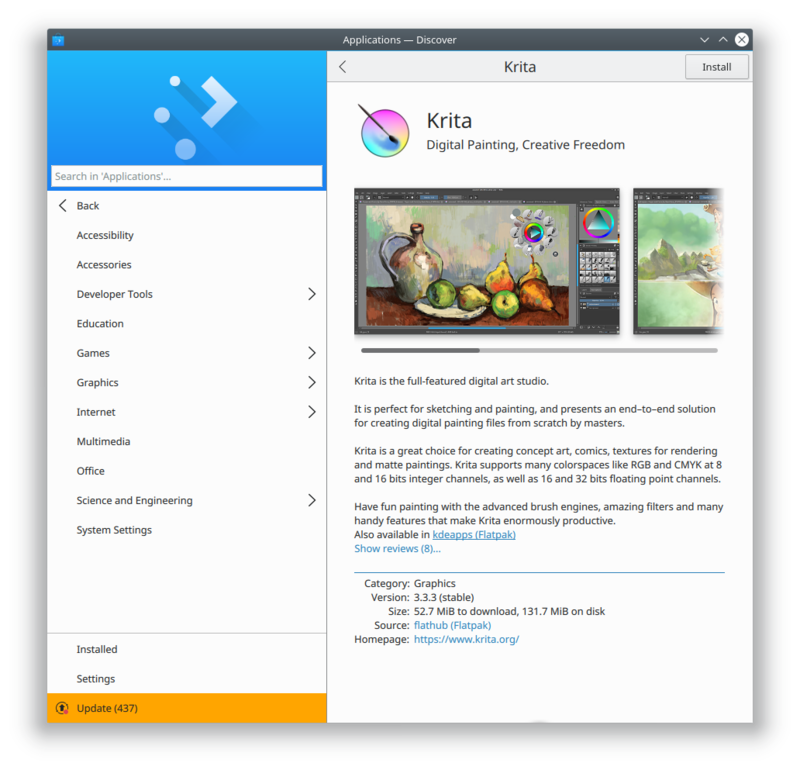 I’d like to thank KDE contributors Andres Betts, Andreas Kainz, and Thomas Pfeiffer for their help with the design work, and Aleix Pol for technical work–and for letting me work on his baby Discover in the first place! 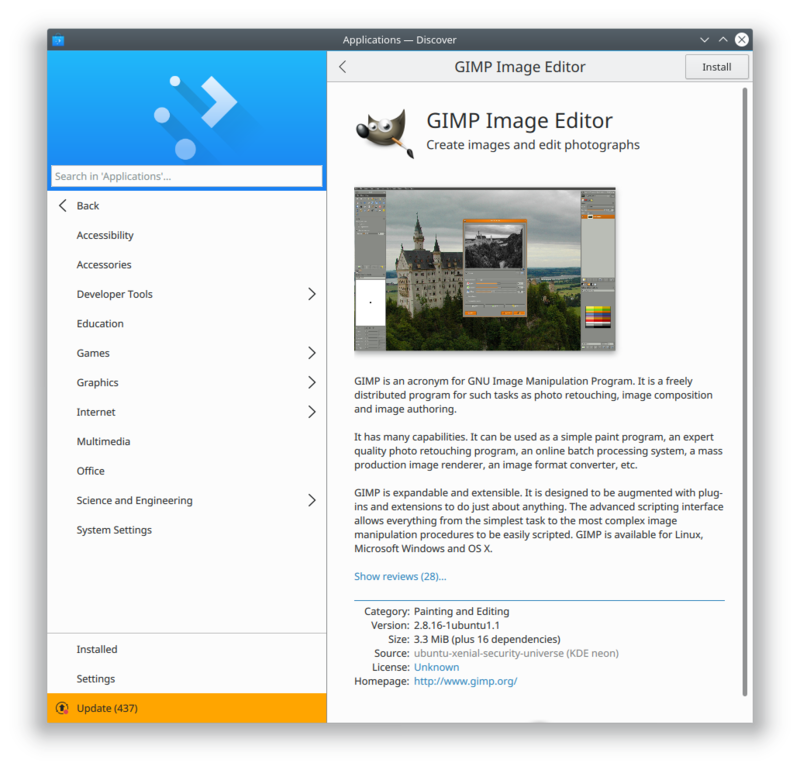 There’s always room for incremental improvement, and there are a few more tweaks we’ll probably make before Plasma 5.12 is released. But we don’t currently have plans to make any radical changes here. 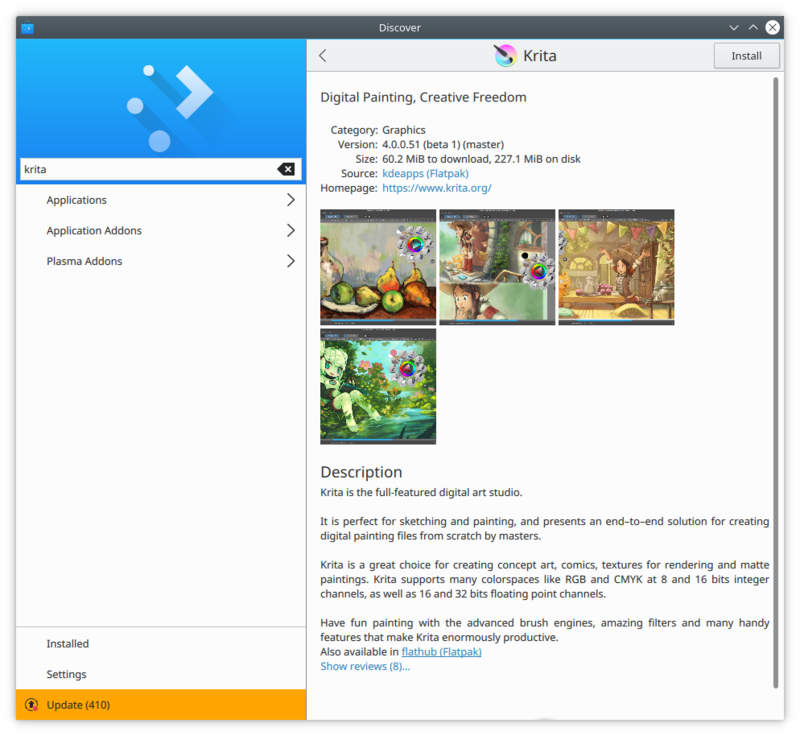 We think you’re all going to love this design in Plasma 5.12! 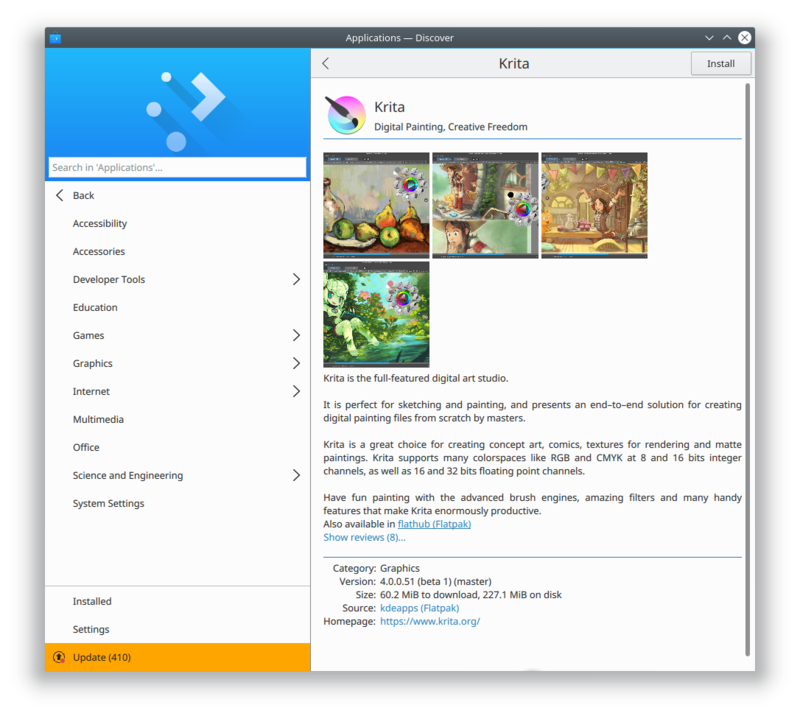 If you like this kind of work, consider jumping on board and helping to push KDE software to even higher heights! 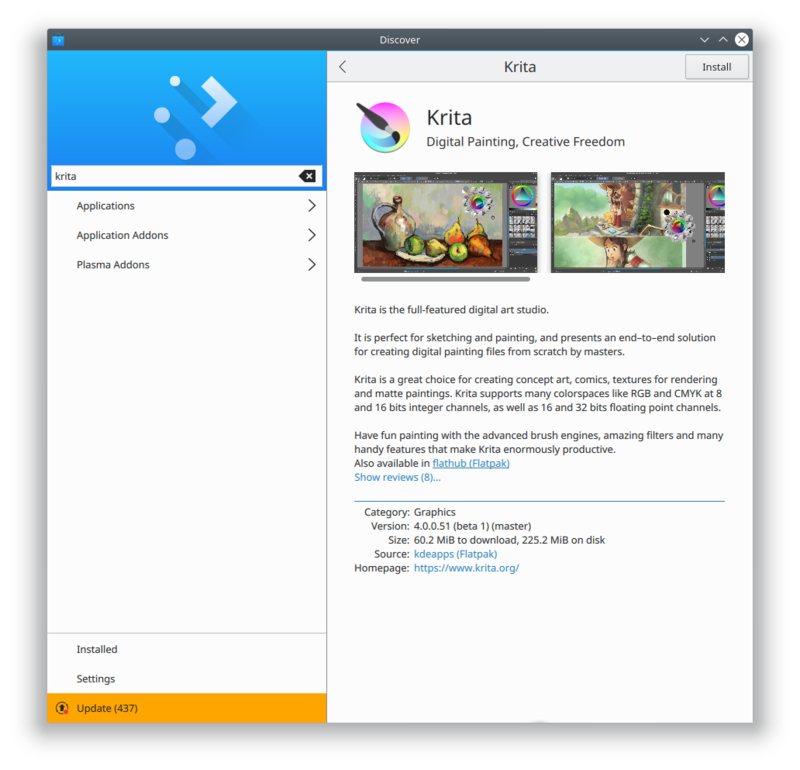 Donating helps, too, and allows KDE to sponsor more work and help students travel to KDE events. Another important task is to get your favorite software to improve its AppStream metadata! Version numbers, screenshots, better text… the better the data we get from apps, the better we can make the app look in Discover. Nate, I appreciate the interest in making Discover better. I also understand the constraints surrounding development in Linux and am sensitive to them. Polishing is one aspect of this effort, and shall certainly be recognized, but you guys may fall in a situation where you’re sort of trying to lipsticking a pig… I had the opportunity to share my impressions with Aleix in his blog about a year ago. Discover has two major problems: the UI itself (lots of wasted screen real state) and stability. Such defficiencies have also been pointed by others and, among other reasons, pushed me away from distros like Neon and Kubuntu. In my personal view a full Discover revamp has been needed for long, and I’m disappointed to see that it won’t come soon. Congratulations for the initiative though. We’ve been pushing really hard on stability and have made huge strides for 5.12. I think you’ll be pleasantly surprised. As for wasted space, we’re working on it. We recently improved the information economy on app list list views. See the screenshot on https://pointieststick.wordpress.com/2018/01/11/this-week-in-usability-and-productivity/. 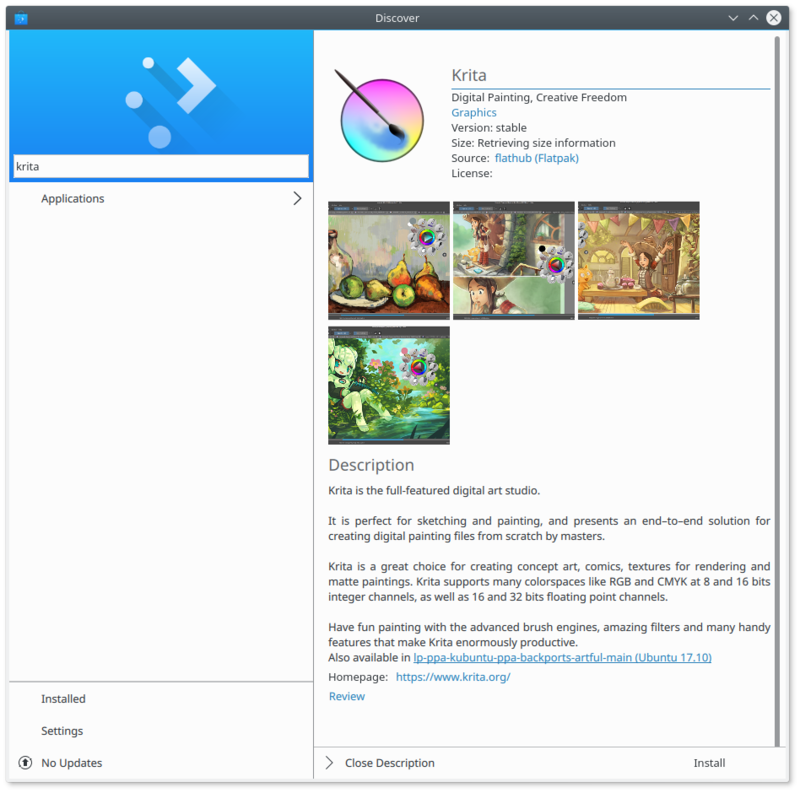 We’re additionally working on making the sidebar less wide (https://bugs.kde.org/show_bug.cgi?id=385992) and reducing the huge image headers (https://bugs.kde.org/show_bug.cgi?id=385973). Looks very nice ! Thank you. It’ looking good. But why are there some “unknown” licenses and some apps that don’t even show the license? When I’m searching for applications that’s the most important field to me. It would also be great to be able to filter out non-free software, if they happen to be in the repository. It’s entirely up to the app developers to make that information available (and if they don’t, packagers need to fill in the gaps, and they can miss things). Please file bugs on the apps in question and encourage them to add license information to their AppStream metadata files. This is really important, and I’m glad to see that you’re so interested in helping out! Oooh, nice! Looks very polished. 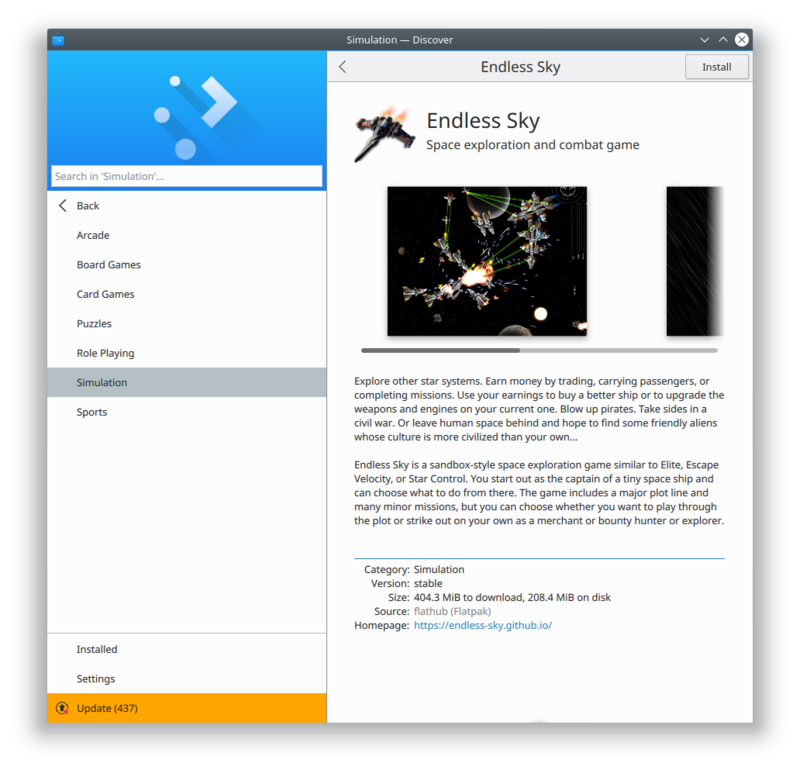 For me it still looks like an alien application in KDE. It has some sort of “phone app” style and simplicity into it. Personally I would appreciate a classic menu on top, a classic toolbar bellow with buttons like ‘Install’, ‘Uninstall’ etc. I would also appreciate not having functional buttons in odd places for a desktop application: main buttons on the down-left side is unintuitive. These are higher-level discussions. Would you like to be included in Discover’s design process? Interesting. I on the other hand would appreciate more KDE apps getting a similar visual treatment to the upcoming Discover. > Would you like to be included in Discover’s design process? I mainly use Gentoo and I don’t expect Discover to be compatible with it anytime soon. Thanks but I guess I can’t contribute more than these ideas up there. This starts to look like a app you would like to eat if you could, good work and thanks for being so detailed about the decisions! I’m sure this is helpful for other projects as well. In the mobile view, the download button have another color which makes it very easy to spot. Could we have the same “call to action” on desktop by coloring the download button there as well? Many projects have outdated/poor screenshots. 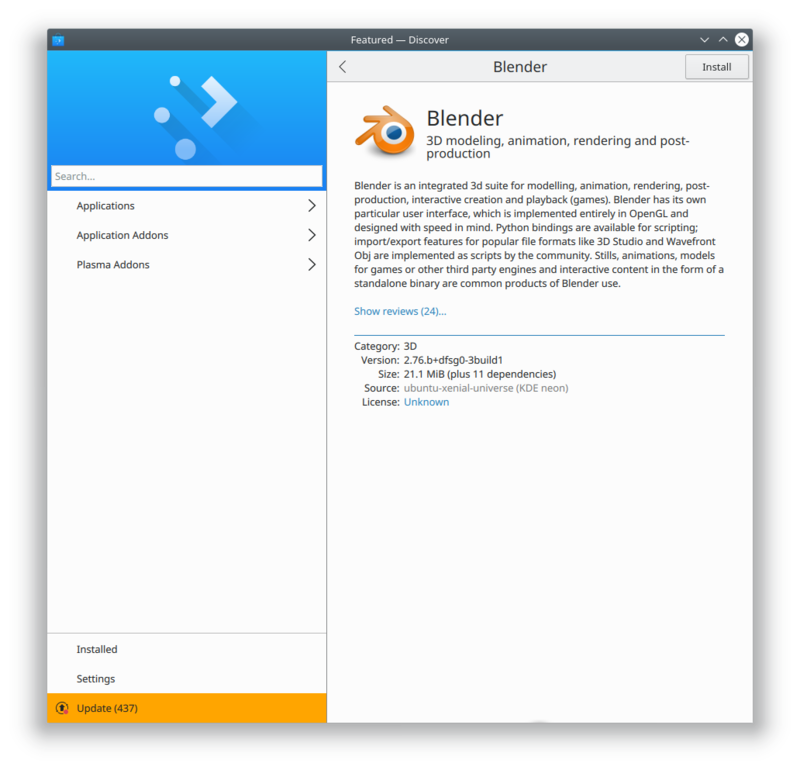 Large projects like Blender and Thunderbird is missing screenshots. How can we help adding more and better screenshots? Would it be possible to show users what’s new in a application? Either by text in the description or maybe by linking the version number in the meta data section, so that when the user clicks on it the changelog will display? 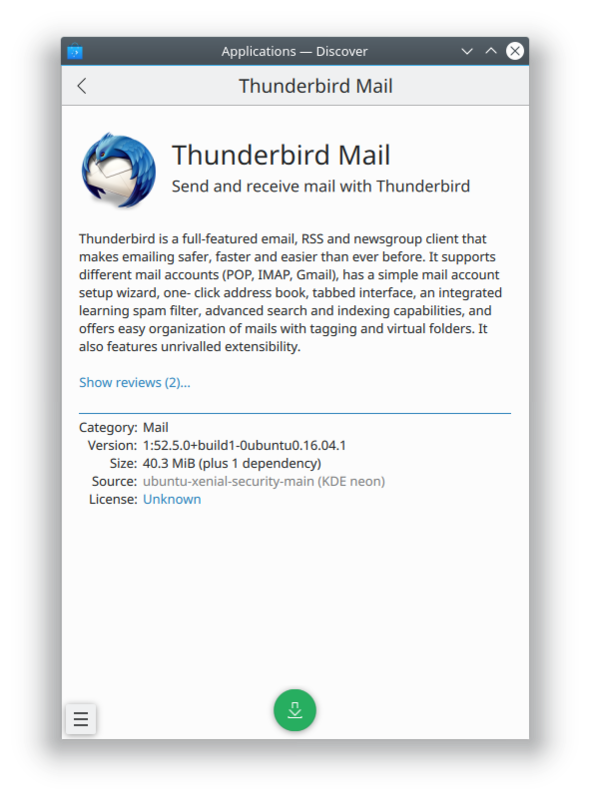 The appcenter in elementary OS is showing users where they can report bugs or get help with a application. Do you think Discover could benefit from having something similar? 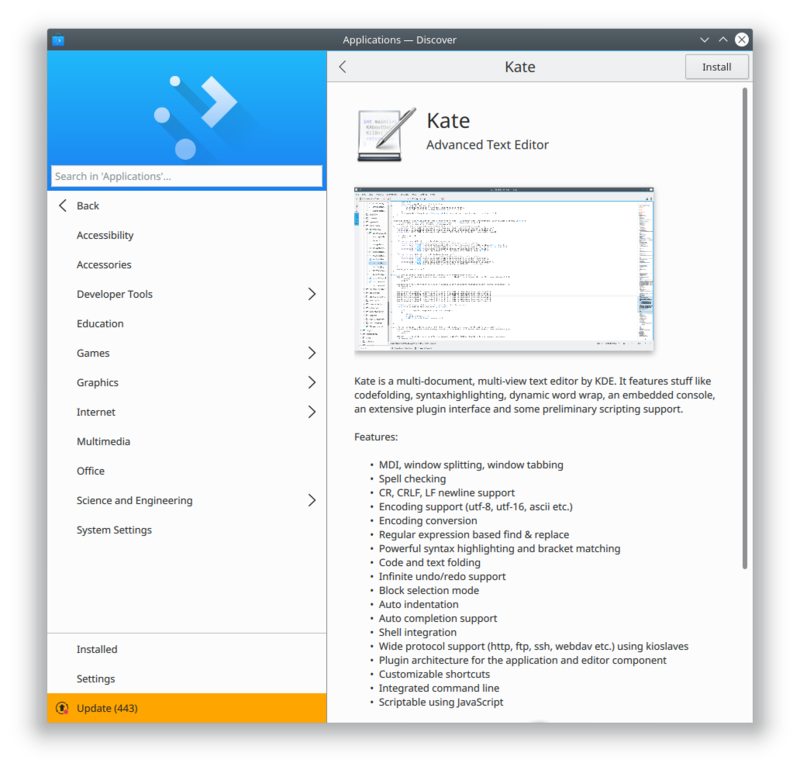 I assume Discover is primarily for a KDE desktop, but can it still be used by others as well? 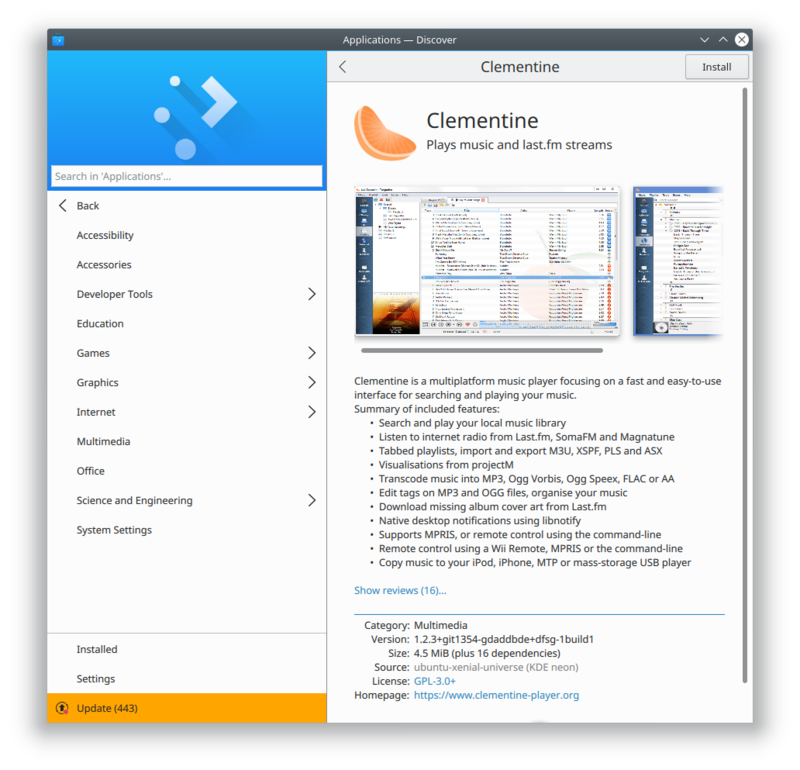 Say GNOME decided to drop their Software Center, could Ubuntu (which now is back on GNOME) easely replace Software Center with Discover? 2. The best way is to submit patches for the affected software, adding the missing/poor quality information into their AppStream file. If they don’t even have an AppStream file, create one for them (for example, I did this for Blender: https://developer.blender.org/T53611). I wrote an article about doing this from a more technical perspective (https://pointieststick.wordpress.com/2018/01/14/how-you-can-help-drive-flatpak-adoption/) but the information applies as well for text and screenshots. 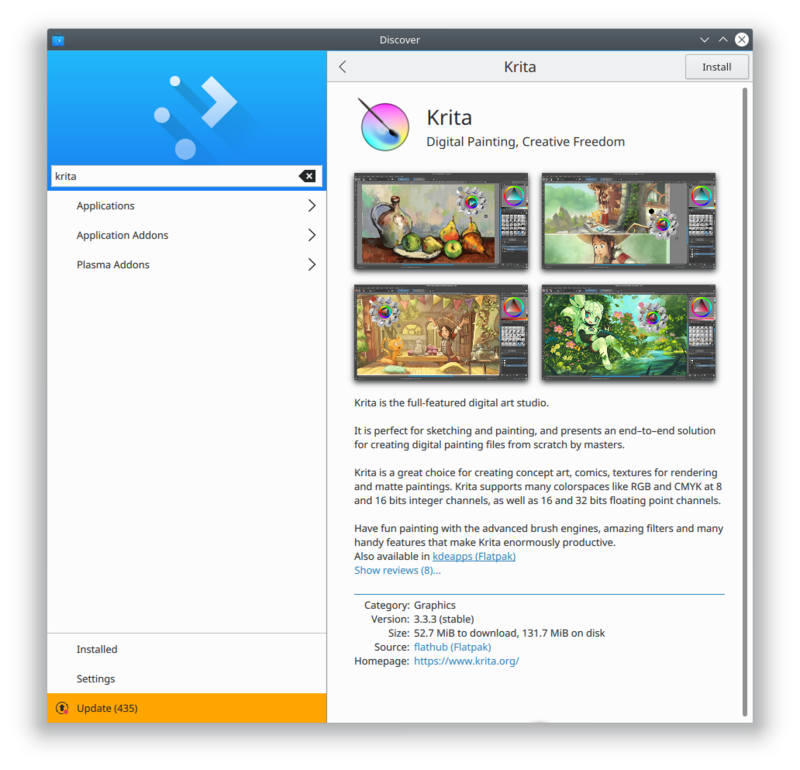 I plan to write another post soon about how we can help developers present their apps better, and then turn this into a wiki page on https://community.kde.org. 5. 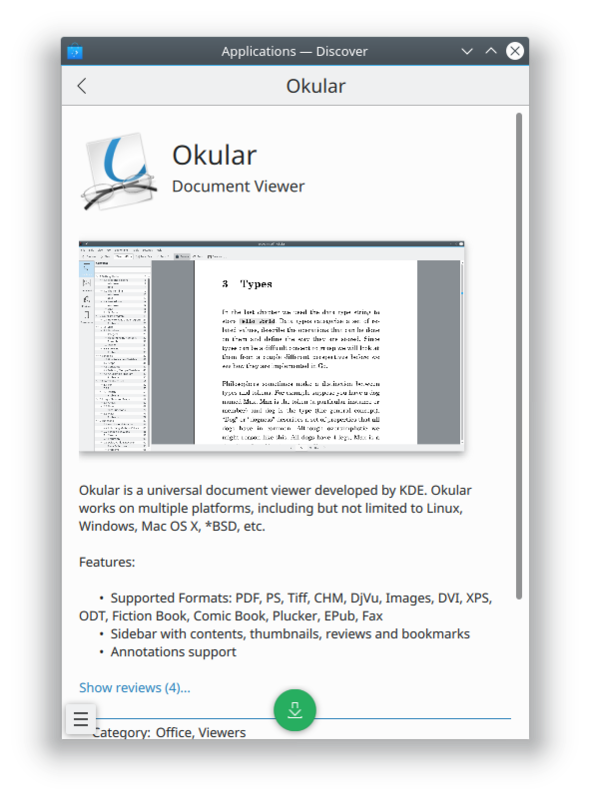 Yup, Discover works on any Linux distro. It will pull in some KDE dependencies, but it’ll work just fine.